Today's a sleety, rainy, cloudy, brrrrr kinda day and I for one am going stir-crazy not being able to get outside in the garden. 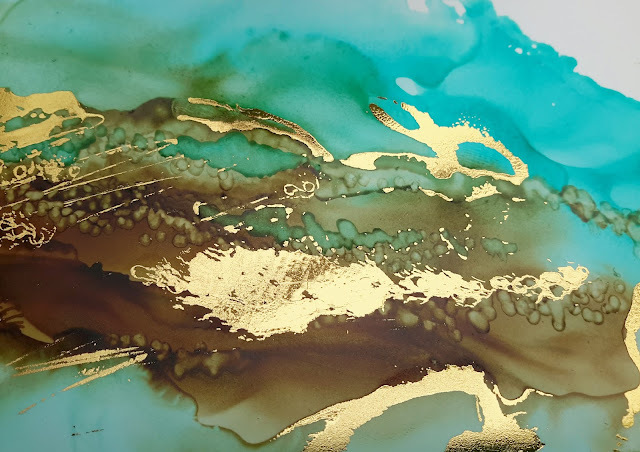 My card today is similar to one I made a while back using just 2 alcohol inks and foil. 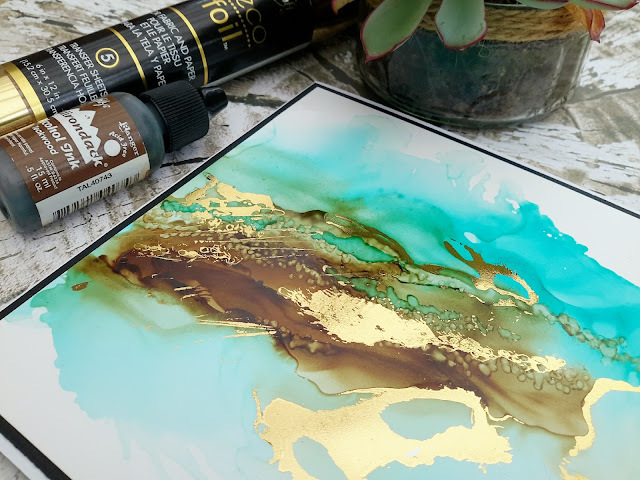 I did make a video (Click here) of the process but since then I've been asked many times about the foiling and what I used to blow the inks around. Firstly, on this card and the original, the foil adhered to the inks because some colours, like Teakwood, have a tendency to remain sticky where it pools. If it hadn't remained sticky then I could have just used glue like Flitterglu. 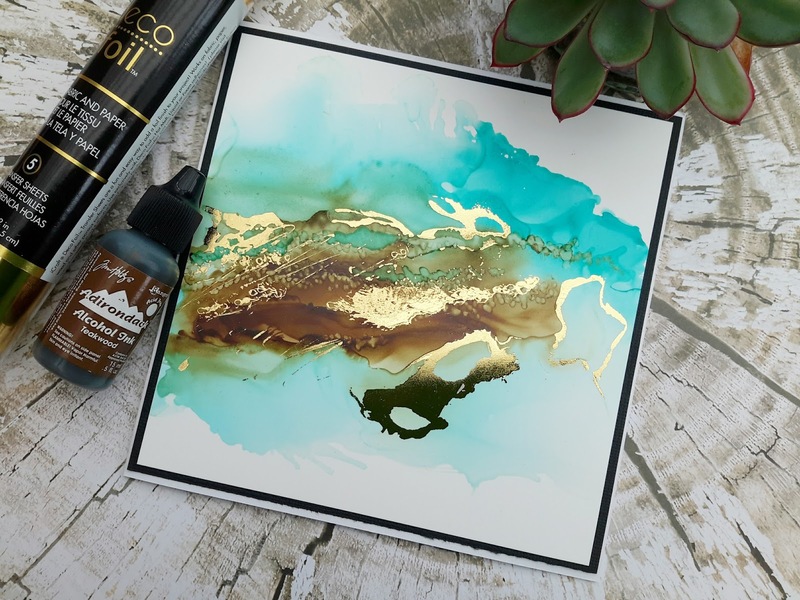 If you Google 'Decofoil' you'll find tonnes of ways of adding foil to your projects, whether it's using a laminator, glue pen, adhesive tape, etc, etc... Trust me, you don't need anything flashy or expensive, just sticky. 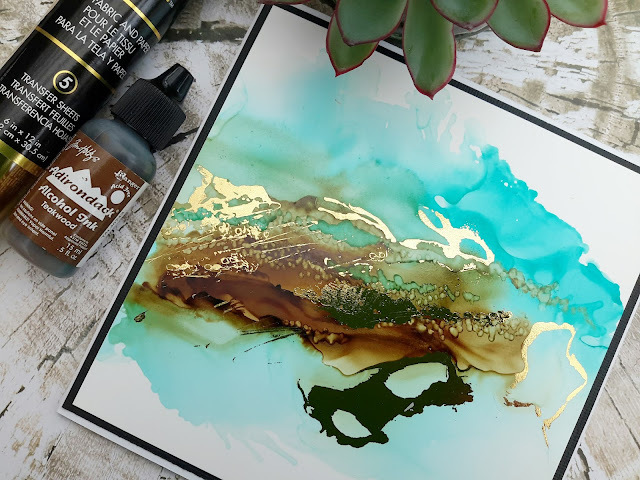 Again, on the original card and in the video, I used a Tim Holtz air spritzer to blow the inks about but honestly you don't need a fancy gadget. I didn't buy the spritzer for these inks originally but it did work great with this technique and saved me having to get in close and blow the inks. If you've got enough puff then go ahead and just blow the inks or (if they don't ban them completely) use a straw. If you're doing large areas then use a hairdryer. Again, you don't need anything fancy. Alcohol inks are free spirits. They have a mind of their own, but that's part of the fun. Just go with the flow and enjoy! If you'd like to see the original video click here.